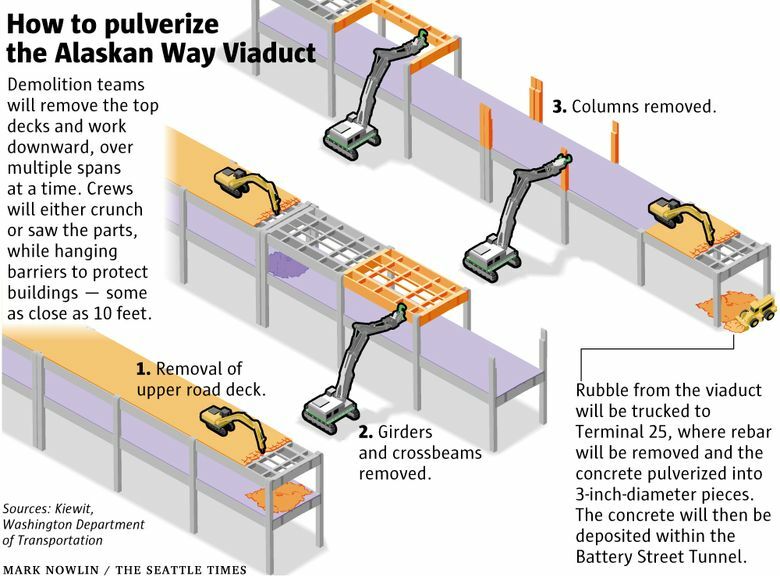 Kiewit Infrastructure West, prime contractor for the $75 million demolition of the Alaskan Way Viaduct, has ironed out its final strategy for the work, which is expected to take up to 5 1/2 months. Visitors to the Seattle waterfront will hear the crunch of breaking concrete this February, while demolition equipment pivots through clouds of dust and mist, flexing spiked jaws that will munch the six-story-high columns and slice through rebar. Tuesday: 5 - 8 p.m.; Waterfront Space; 1400 Western Ave.
Wednesday: 11 a.m. - 2 p.m., Waterfront Space, 1400 Western Ave.
For the next 5-1/2 months, crews will demolish the Alaskan Way Viaduct, working on three to five sections at a time. Reinforced fabric shrouds will be hung from frames that contractors can move along the route to protect building walls and windows. Kiewit Infrastructure West, prime contractor for the $40 million job, has settled on its final strategy for the work, which senior operations manager Phil Wallace outlined in an interview. The Washington State Department of Transportation (WSDOT) announced details Tuesday and will hold three public briefings. “What you’re going to see is the waterfront opening up, and by June you’re going to see a pretty wide open waterfront, without the viaduct there,” said Laura Newborn, a WSDOT spokeswoman. This may provide the city’s greatest demolition spectacle since 2000, when pyrotechnicians imploded the Kingdome in only 17 seconds. More recently, in 2011 the state removed the southern mile of the viaduct over Sodo in nine days, but the governor missed a self-imposed 2012 deadline to remove the 1.4 miles left downtown. 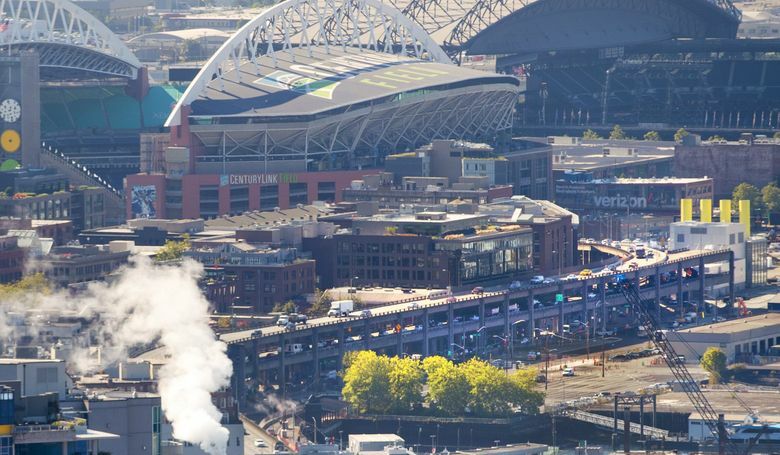 The 65-year-old Viaduct will be replaced by a four-lane Highway 99 tunnel, along with Sodo and South Lake Union interchanges, scheduled to open the week of Feb. 4. The program costs at least $3.3 billion, funded mostly by gas taxes. Demolition equipment will clutter the waterfront, changing locations every 30 days or so. “The waterfront is open for business during demolition,” promises Brian Nielsen, the state’s Highway 99 administrator. In a new development, Kiewit and WSDOT told business leaders late Thursday they’ll complete all teardowns by June 1, except a few blocks near Lenora Street and the curve south of King Street, that might remain until July 31. That means the central waterfront would be clear the weekend after Memorial Day, and angle parking would be added, said Bob Donegan, president of Ivar’s restaurants. The June 1 target was unveiled in a two-hour meeting with the Seattle Historic Waterfront Association and representatives from Pioneer Square and Pike Place Market, he said. “We were overjoyed to hear this,” said Donegan, who admits to being infuriated weeks ago, when the state postponed a fall tunnel opening and its timeline to finish demolition by spring 2019. Crews will work in sections of two to three blocks at a time. They will generally start by punching decks with jackhammers. Then the concrete beams will be demolished with a crab-claw-shape tool. Water will be sprayed on the dust to knock it down, and silty wastewater is to be processed onsite, Newborn said. That treatment would be similar to how Seattle Tunnel Partners pumped water into settling tanks, the size of shipping containers, to capture grit before releasing wastewater into the county sewer system. Kiewit’s demolition subcontractor, FERMA, will begin work over train tracks near Pike Place Market, removing concrete only at night, to avoid freight and passenger trains using the Great Northern Tunnel. “That is first-order work for us, so we can get out of the area as soon as possible,” Wallace said. Soon afterward, the far north end of the viaduct will be removed, Wallace said, so the city can start building the signature Overlook Walk from the Market to Seattle Aquarium. FERMA will bring excavator machines with arms tall enough to reach upper decks, said Wallace. That’s a change from Kiewit’s initial plan to keep old viaduct ramps in place several weeks, so machines could be driven onto the viaduct decks. The Columbia Street onramp will be demolished immediately, so the city can complete paving a permanent two-way street beneath to serve West Seattle bus routes. The Marion Street pedestrian bridge to state ferries at Colman Dock will also be removed early. Wallace said a temporary steel footbridge will be installed to maintain walk-on access from First Avenue to Colman Dock. It will bend in an L shape from Marion Street over Western Avenue and then turn just north of Columbia Street toward the waterfront, Wallace said. Traffic on four-lane, surface Alaskan Way will be narrowed in places to one lane each direction. This will aggravate traffic congestion in Seattle’s “period of maximum constraint” downtown. Viaduct debris will be trucked to Pier 25, just north of the West Seattle Bridge, where concrete will be stripped off the rebar, and pulverized to a required 3-inch diameter or smaller. Processed rubble will be trucked north, and deposited using a conveyor belt into the old Battery Street Tunnel, to a height of 10 feet, Wallace said. That rubble will be topped by low density concrete fill, pumped into the old tunnel. This scheme keeps truck traffic on or near Alaskan Way — so there’s no need to drive trucks along steep, crowded Denny Way, as outlined in Kiewit’s initial bid proposal. Demolishers will recycle 150 tons of structural steel braces that WSDOT installed since the 2001 Nisqually earthquake, where columns sank near Yesler Way. Total mass of the viaduct, at 122,000 tons, is nearly the same as the circular, 130,000-ton Kingdome. Heavy demolition will be allowed seven days a week from 7 a.m. to 10 p.m., under city noise permits, though truck trips and equipment staging may continue overnight. The loudest jackhammering of up 90 decibels will wrap up at 8 p.m. weekdays and 5 p.m. weekends, according to WSDOT. Once the viaduct is gone, a $35 million decommissioning of the Battery Street Tunnel will continue into 2020, along with $17.5 million worth of new street connections across lower Aurora Avenue North until 2021, all within the $94 million Kiewit contract. Newborn said contractors will be paid a few million dollars extra, still under negotiation, because of WSDOT’s decision to postpone the opening of the new four-lane Highway 99 tunnel until February, which in turn delayed the initial Jan. 2 date to begin viaduct demolition.